There’s an asterisk next to that statement for a very important reason: We haven’t driven the Impreza five-door yet. Comparing two cars and declaring a winner without driving both is the definition of dumb, but in this case it’s not the stupidest thing in the world. The reason being is that the two are the exact same, plus or minus a few inches of ground clearance. Let’s tick off the similarities real quick before we get into why size matters so much here. Both offer the same naturally aspirated 2.0-liter boxer-four making 148 horsepower and 145 lb-ft of torque. Both offer a CVT or five-speed manual, although the trim level we tested only came with a CVT. Both the Crosstrek and Impreza have nearly identical storage space. The crossover fits 22.3 cubic feet of cargo with the rear seats up and 51.9 cubic feet with them folded. The wagon afflicted with dwarfism—or not afflicted with gigantism if you will—is rated at 22.5 cubic feet of cargo space with the backs seats up and 52.4 cubic feet with them folded. With the CVT the Crosstrek gets and mpg split of 26/34/29. The Impreza records 28/37/31 mpg. We could rattle off a ton of other figures but you get the idea. So why would we give the edge to the crossover? It’s simple, really: If both cars aren’t that fun to drive then we want the one that is more functional. Taller cars can go places shorter ones can’t. But what about the whole "fun to drive" thing? Although the Impreza wagon is closer to the ground that alone wouldn't make up for its woefully underpowered engine. The 2.0-liter boxer engine is pretty damn noisy (and not in a good way), especially with the CVT calling the shots. What about the manual? No, really, what about it? With so little power on offer it’s hard to imagine the difference a manual would make. 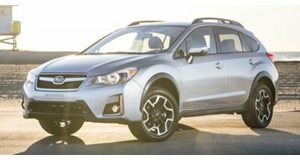 The higher ride height leads the Crosstrek’s body to sway through the corners, which is to be expected. But really, would you trade the 8.7-inches of ground clearance to sit four inches closer to the ground? We wouldn’t. The Crosstrek is the better buy because it does more off the beaten path than the Impreza without sacrificing much, if anything. OK, there is one thing you’ll need to sacrifice, and that’s cash. The Impreza five-door starts at $18,995 whereas the Crosstrek bases at $21,695. If you’re simply comparing the two Subarus and don’t spend much time off-road this could be a deal-breaker. But when you compare the Crosstrek to other crossovers it’s actually a really good buy. The cabin materials aren't top-notch but the interior still passes as nice. That being said we did notice some interior panels rattling on rougher roads and never found the ride to be incredibly comfortable. Subaru’s mpg ratings also seem a bit ambitious as we averaged just 21 mpg during the best of times. At the end of the day the Crosstrek is an honest, blue collar car whose greatest strength is standard features. There's all-wheel drive, solid interior space (for four) and outdoorsy-friendly bits and bobs like raised roof rails and a rubber-ish cargo tray that was perfect for holding pairs of muddy shoes after a hike. 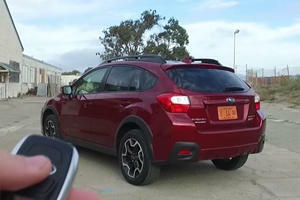 Now our Crosstrek stickered at $28,840 with options. Normally when we test cars we can live without the options they come with, but here we’re going to do a 180. Option Package 23 checked in at $2,895 and included a power moonroof, Subaru’s Starlink 7.0-inch infortainment system, keyless access with push-button start and EyeSight. EyeSight is a suite of safety features made up of a pre-collision braking system, adaptive cruise control, lane departure and sway warnings and pre-collision throttle management. The two cameras that give the system its eyes are placed in the cabin, right under the rearview mirror, ensuring that you don’t have to worry about them getting dirty or rained on during storms. During our week with the Crosstrek it rained in San Francisco. We found EyeSight and Subaru’s Symmetrical all-wheel drive to be a potent combination, inspiring confidence as we mashed the throttle and waited for the engine to respond. Subaru is offering a lot of car for $30,000, but not in the traditional sense. 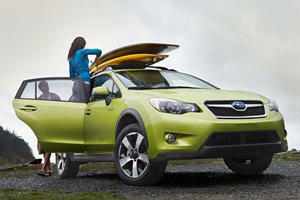 The Crosstrek won’t blow you away with its luxurious cabin or good looks. It’s not all that fun to drive. But it’s also more capable than many other crossovers out there. If you care more about spending time outside than appearances this is the car for you. Uh, it's the only jacked-up Impreza. 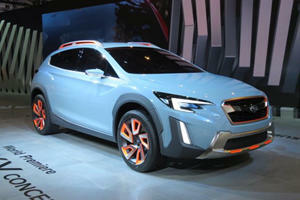 And now Subaru is left without a hybrid model, for now. But will it actually look this good when it hits showrooms?